Ingredients: Noodles: Wheat Flour, Salt, Acidity Regulators (E500, E501), Colour (E160a). Powdered Soup: Salt, Palm Oil Powder (Palm Oil, Maltodextrin, Modified Starch, Water), Flavour Enhancers (E621, E635), Roasted Garlic Powder (Dried Garlic, Starch, Flavour Oil (Rapeseed Oil, Dried Garlic)), Sugar, Powdered Sesame Oil (Sesame Oil, Dextrin), Grated Sesame Seed, Yeast Extract (Yeast Extract, Dextrin), Flavouring (Contains Sesame), Dried Leek, Vegetable Extract (Dextrin, Vegetable Extract (Potato, Onion, Carrot), Salt), Anti-caking Agent (E551), White Pepper, Colour (E150a). 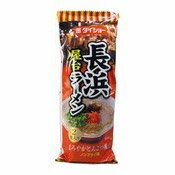 Simply enter your details below and we will send you an e-mail when “Nagahama Yatai Ramen (With Soup) (長浜拉麵)” is back in stock!